Finding the perfect steel is tough. Not only are there so many types available but there are also tons of factors to consider — price, ease of sharpening, hardness, corrosion resistance, and more. The perfect steel is ever elusive, but you can pick the right steel for the job. If you want a steel that’s nearly stainless but has great edge retention and wear-resistance, opt for D2. D2 tool steel has been around for a very long time. It became popular as a tool steel during World War II in factories. In terms of knives, knife makers Wayne Goddard and Bob Dozier pioneered the use of D2 steel in knives. In fact, Dozier is sometimes called Dr. D2. 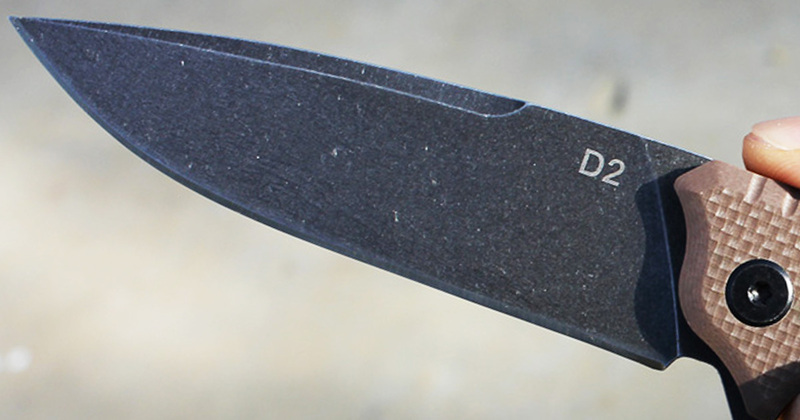 While D2 does sacrifice ease of sharpening and some corrosion resistance, it remains an excellent choice for knife users everywhere. If you’re interested in seeing what D2 has to offer, I collected a list of 20 knives that showcase the variety of D2 knives. Take a look. The RAT 1 is one of the most beloved budget knives of all time. It (and its smaller brother the RAT 2) are praised for their designs and overall utility. The only major complaint the RAT 1 gets is its adequate AUS-8 blade steel. So Ontario Knife Company came back with a D2 version of the knife. The one I’m highlighting here is an all-around fantastic limited edition version with a D2 blade and a carbon fiber laminated G-10 handle. It doesn’t cut down on the weight as much as I’d like, but it looks and feels great in the hand. Other than the upgrades, the limited edition RAT 1 maintains the same design elements as the original. “This knife is a tank.” I’ve heard that about the Benchmade Adamas a million times, and it’s not hard to see why the folding version gets so much love. 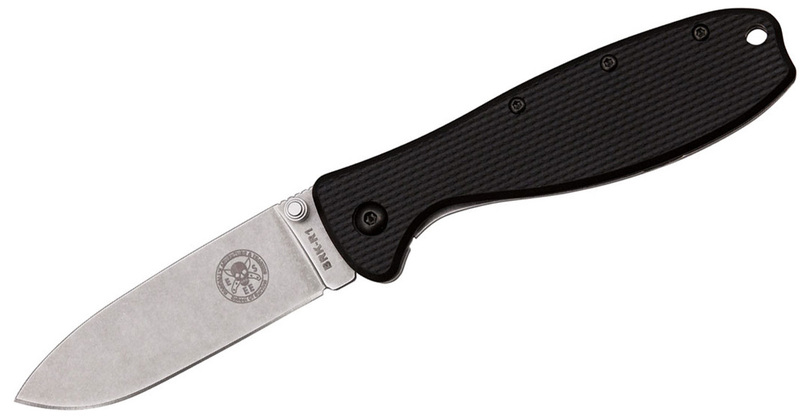 The 3.82-inch blade is 0.160 inches thick while the handle features liners and G-10 handle scales. Coming in at more than 7 ounces, the weight would be a liability in a lesser knife but the Adamas uses it as leverage in heavy-duty tasks. The manual-opening version of the Adamas was our Badass Knife of the Week in the past and it’s sold well over the past few years. With a heavy-duty knife like this, it’s no surprise Benchmade decided to go with a workhorse steel like D2. ESEE is a purveyor of some of the cheapest D2 knives you can get; unfortunately, we rarely have them in stock at Knife Depot. One of those knives is the Avispa. This is a frame locking blade with a 3.5-inch D2 steel blade. 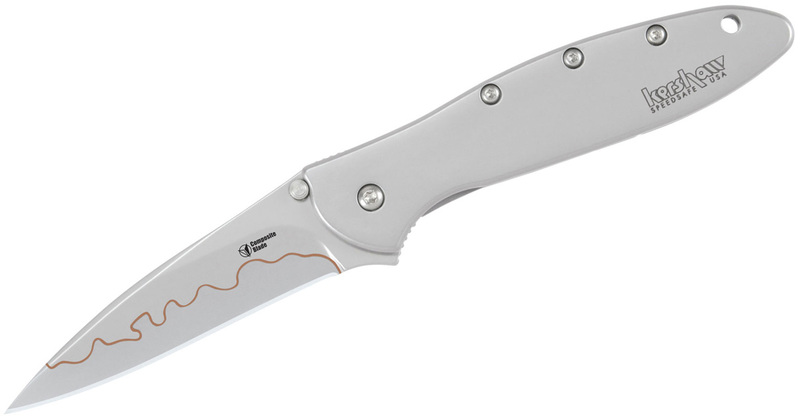 The knife is designed and endorsed by the same guys behind the RAT series, which is why the handle looks so similar. The Zancudo is the smaller version of the Avispa. It has a 2.94-inch blade made from D2 steel with a similar black fiberglass-reinforced nylon handle slab on one side and steel on the other. Just beware of these two because they’re also available in AUS-8, but for a few bucks more, might as well go for the D2 versions. Schrade really excelled the past few years at the helm of the Taylor family before it was unfortunately sold to BTI Tools. 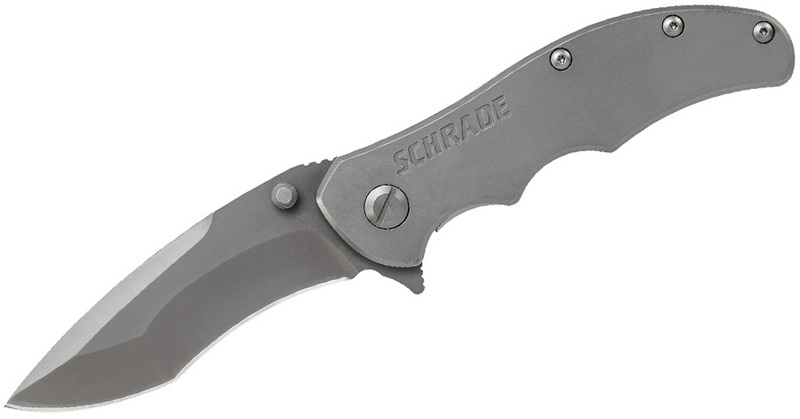 The Schrade SCH600Ti is a good example of the interesting knives the brand came out with. The knife has a blade with a pronounced recurve and a modified drop point that is almost a tanto profile. Schrade often opted for budget steels, so it was welcomed to see D2 used. The titanium handle has nice ergonomics, and the blade engages with a flipper. All in all, this frame lock is a good option for an EDC. I feel like the image of the DPx Gear HEAT/F doesn’t do the knife justice. This sucker is a beast in what DPx Gear calls a “beefy, pocket friendly package.” Standing for Hostile Environment At Hand Tool, the HEAT is made with law enforcement in mind and boasts a glass breaker, rapid deployment, a non lethal ergonomic grip, and quality. The blade may only be 2.26 inches, but it packs a hell of a punch. 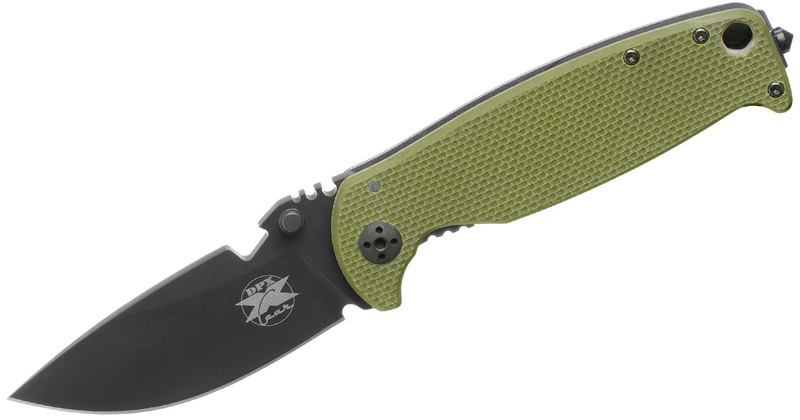 The stonewashed 6Al4V grade 5 titanium alloy frame lock is accented by a single American-made OD Green G10 handle scale for a reliable grip. This is another one of those hard-working EDC knives you want by your side if you need something really tough. Composite blades are a great invention. You get the best of two knife worlds combined in a single blade. Technology has advanced far enough so that the composite blade is reliable and seamless. 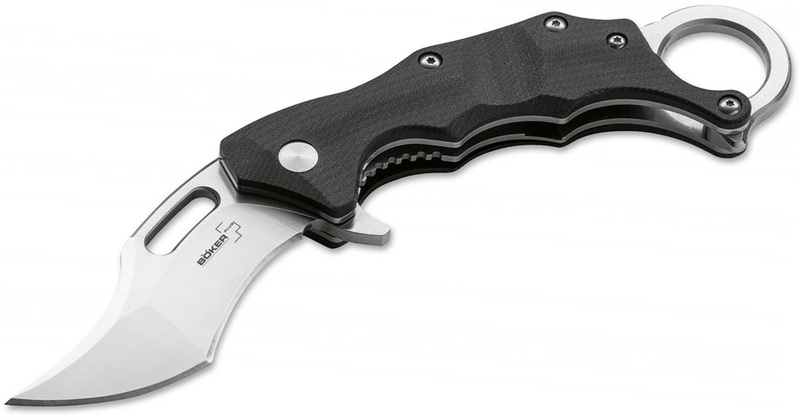 In true Kershaw fashion, the company took the iconic Leek and equipped it with its composite blade technology. Although the blade is not completely D2 steel, the cutting edge is while the spine is Sandvik 14C28N. This is an iconic knife that I’m sure most of you already have in your collection, and the composite blade makes it even better. I love the look of the wavy copper line that fuses the two steels together. Other than the composite blade, there’s not much left that needs to be said about the Leek. The RAT 1 isn’t the only Ontario knife to feature D2 steel. The Carter Prime was introduced only a few years ago and has already risen through the ranks as an underrated EDC knife. 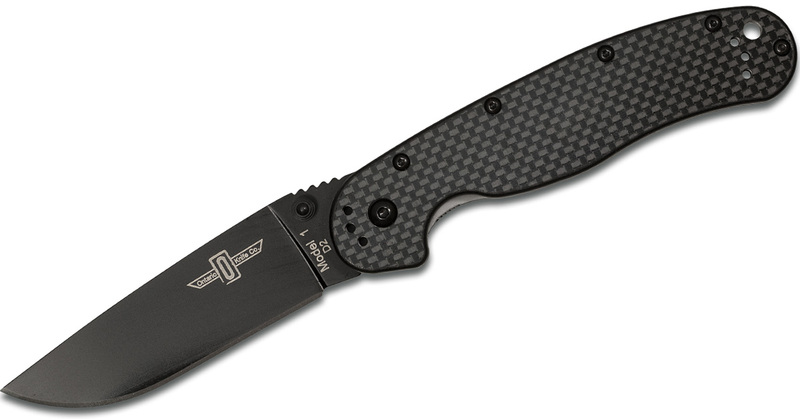 The knife is designed by Robert Carter, the son of Joe Pardue of Ontario Utilitac fame and grandson of Mel Pardue of Benchmade Griptilian fame. 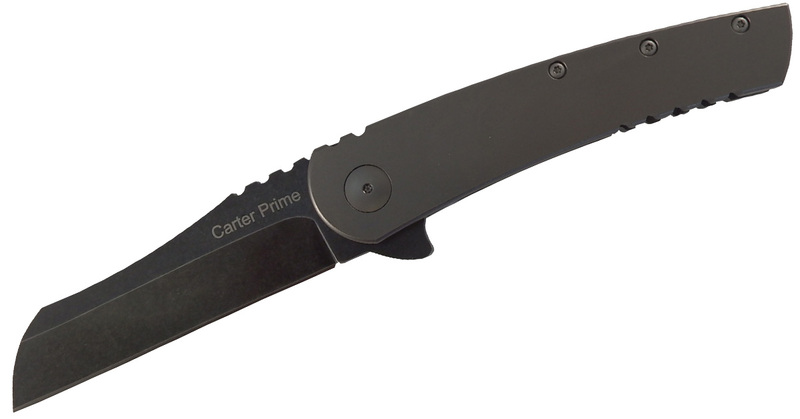 The Carter Prime is a flipper with a 3.37-inch D2 blade and a lightweight anodized titanium handle. The sheepsfoot blade profile is surprisingly versatile and the knife works well as a hard-use EDC — somewhere between the Adamas and Kershaw Leek. 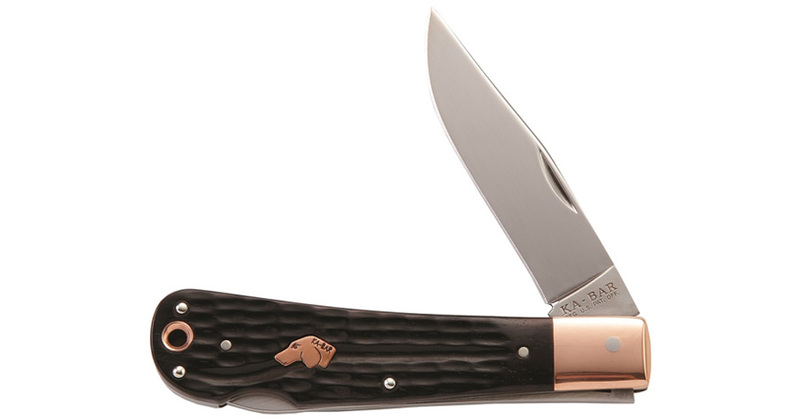 So far most of the knives have been newer designs, but KA-BAR changes that with its Dog’s Head series. Knives in this series use traditional designs and workmanship, which is why they’re all made in the USA with American materials. The Large Coppersmith folder is one of my favorites. It has a nail nick on the 3.625-inch blade and a dog’s head in the jigged bone handle. 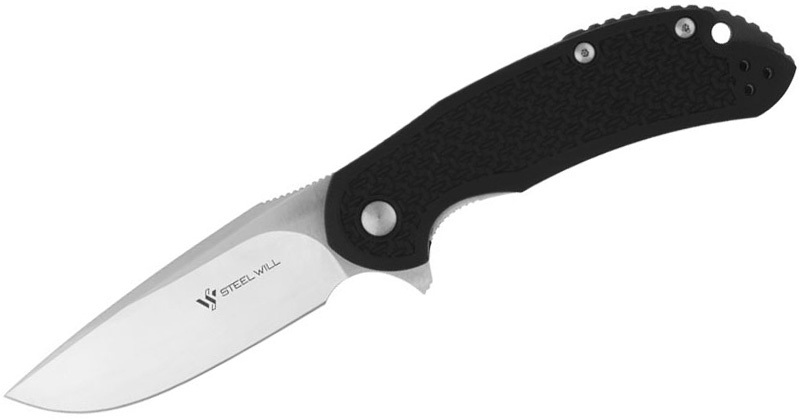 The blade uses D2 steel in an interesting choice and stays engaged with a lock back mechanism. There are a few other folders and fixed blades in the series that also use D2 steel. If you haven’t yet heard of Kizlyar Supreme, you will soon. The brand is based in Russia and has earned a reputation first in Australia and then other places as a company that makes high-end knives at cheaper prices. The Whisper is a good example. 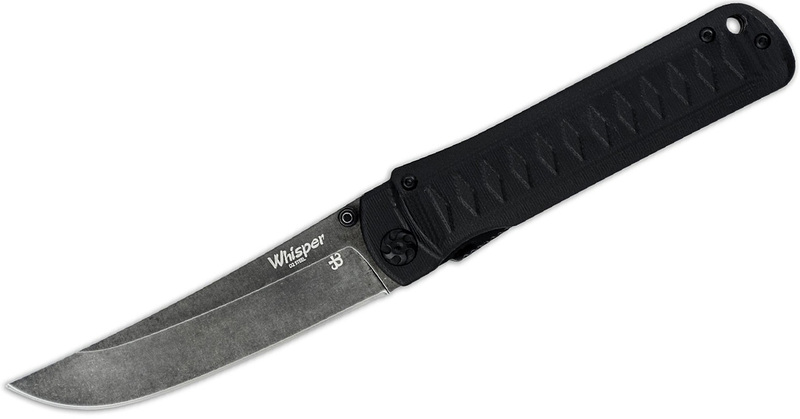 The Whisper has a 3.75-inch D2 blade with a true tanto shape (unlike those westernized versions of the tanto). The handle uses milled G-10 with nested stainless steel liners. This EDC really leans on the Japanese knives, thanks to the diamond pattern often seen in wrapped handles. 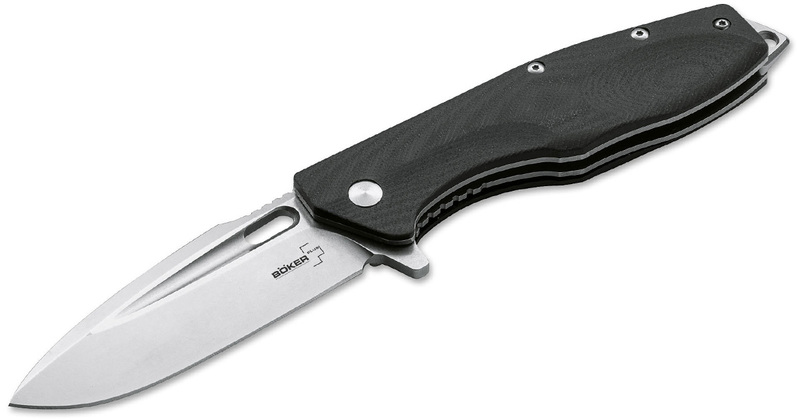 Boker doesn’t dabble much in D2 steel, but it did use D2 in its Boker Plus Caracal. The knife is touted as a modern and rugged utility knife and fewer steels fit better than D2. 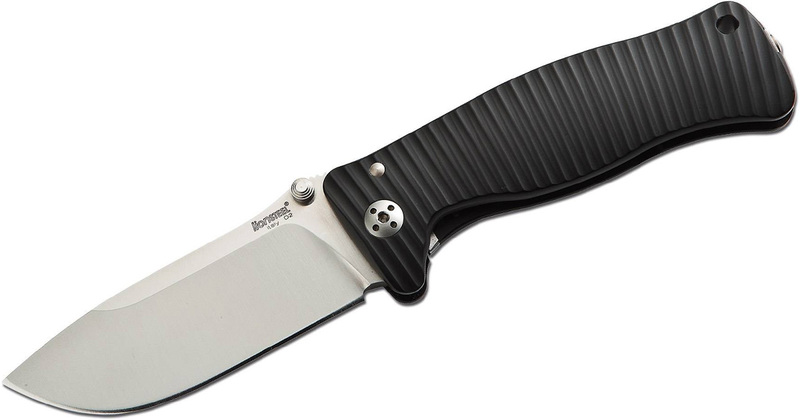 This is a sleek flipper with a 3.42-inch blade and black G-10 handle scales. Ball bearings make opening the blade smooth and reliable. A deep carry pocket clip and an impact element are nice touches on this EDC. Although this post is only about folders, there is a fixed blade version of the Caracal with D2 steel as well. I dare you to find a more handsome knife than the Steel Will Gekko. This brand has been making a name for itself the past few years with premium knives like the Gekko. 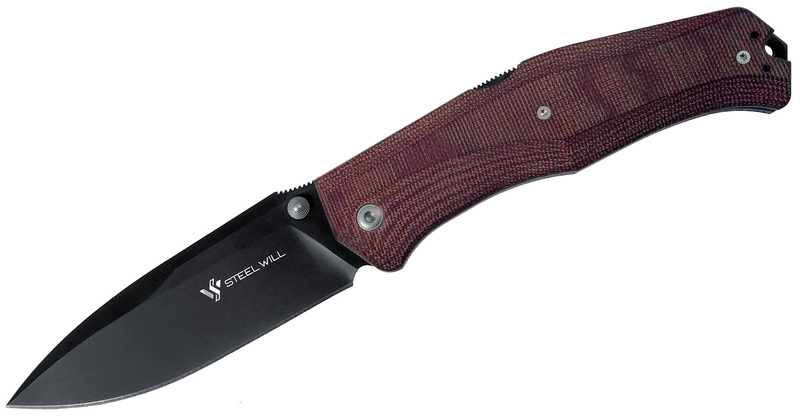 This folder features a nearly 4-inch blade with D2 steel in a versatile drop point shape. The Micarta handles have a kind of purplish hue to them and feel great in the hand. They also perfectly complement the black-coated blade that opens with a thumb stud and stays engaged with a back lock. Is the price higher than some of the others on this list? Yes, but just look at it. 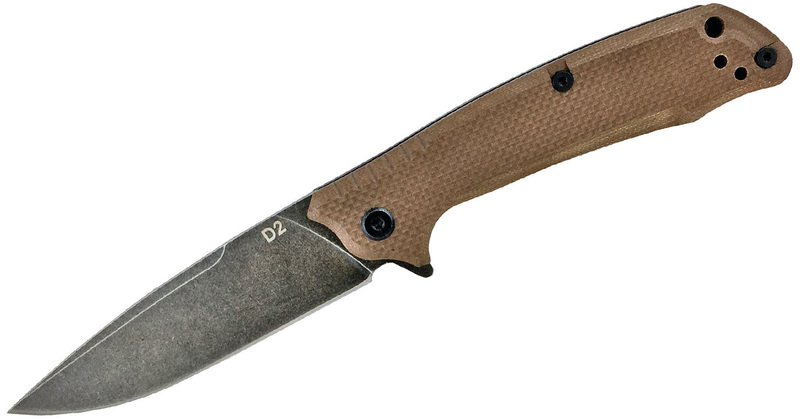 As I said earlier, Bob Dozier is one of the pioneers of D2 steel, so it was only apt to put one of his knives on this list. While most of his D2 knives are customs, the Ontario Dozier Arrow is a production knife. It has a spear point D2 blade that’s 3.6 inches and G-10 handle slabs. A narrow profile helps keep the weight down to a lightweight 2 ounces. This is a knife you can use for everyday carry or for defensive purposes. Steel Will did something interesting in 2017. They made a line of knives called the Cutjack with two tiers: one with D2 steel and one with M390 steel. 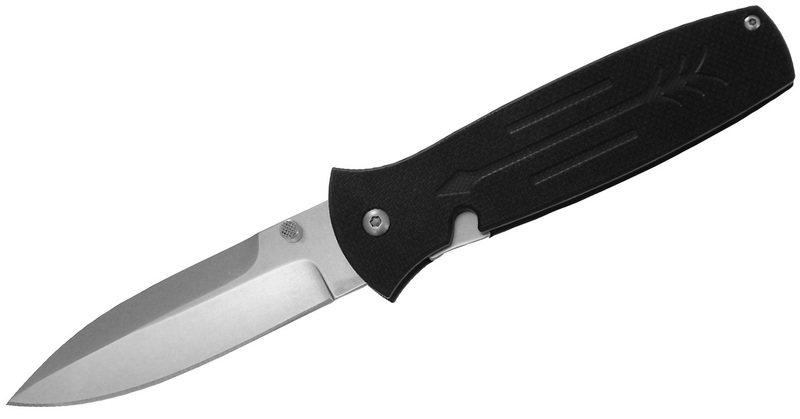 The Cutjack is a surprisingly affordable flipper knife with great ergonomics and great steel. 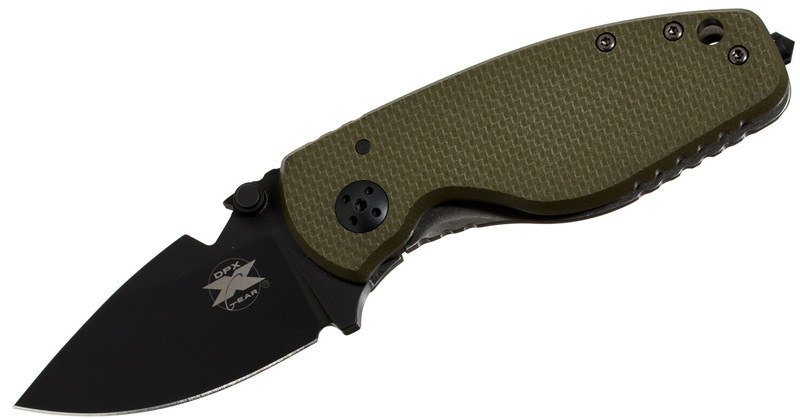 I am partial to the mini version of the Cutjack with a 3-inch blade. This one is kind of a wild card. I wrote a review about this knife from relatively obscure brand American Buffalo Knife and Tool (ABKT). While I really loved the knife, there were problems with quality control in the other knives from the company. 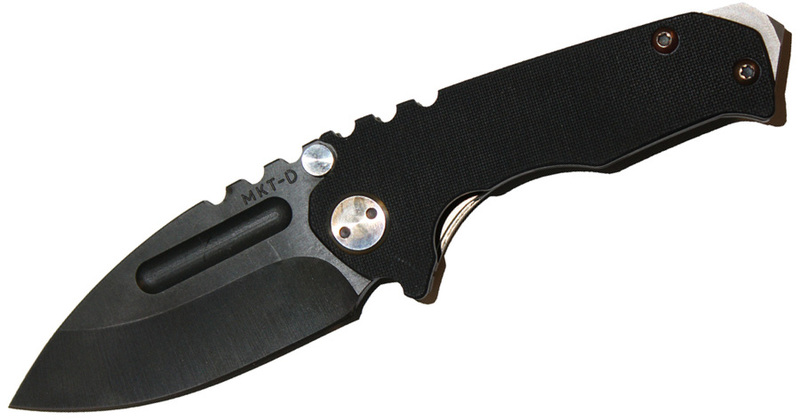 You can get this D2 flipper knife with ball bearings for $50. It might be a risk in terms of quality (though again, the Scavenger I received was top notch), but it could be worth the price. The Boker Plus Wildcat is an interesting knife. The folding karambit has a D2 blade that’s under 3 inches and G-10 handles. The handle itself is very ergonomic and conforms right to the hand. If you’re really interested in learning the knife for self-defense, there’s also a trainer version. This knife raises the question of how much you’re willing to pay for a solid knife. Medford is known for its high prices, but the knives themselves are awesome. The Micro Praetorian G is two thirds the size of the standard Praetorian. It has a D2 blade at 2.8 inches and a big bite. There are a few knives on this list whose design and construction may not reach its price tag but I didn’t want to exclude them from the list. This was a Badass Knife of the Week not long ago because of its excellent design, useful features, and quality. The DPx Gear HEST/F 2.0 is jam-packed with features and things to explore, and it’s likened to the strength and durability of a fixed blade. 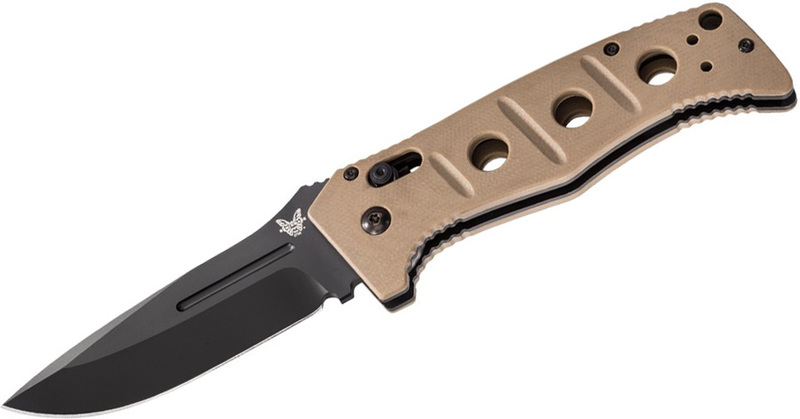 The Infidel is one of Benchmade’s most popular knives. 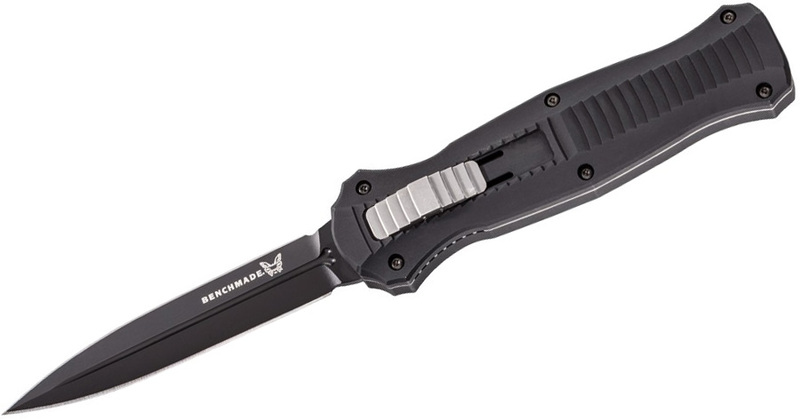 It is an out-the-front automatic knife with smooth action and a great build. 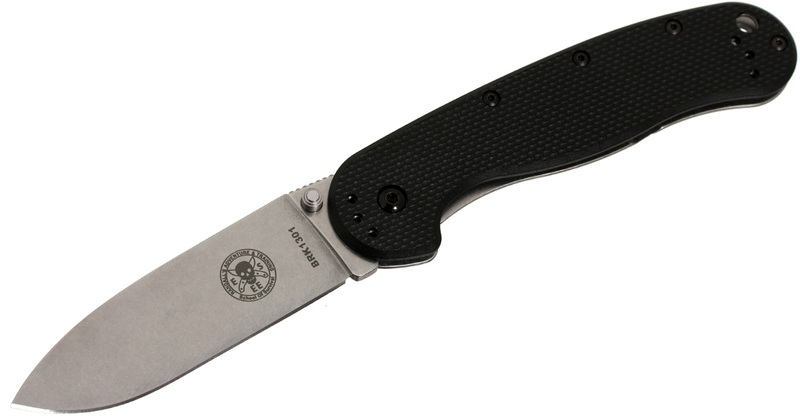 It has a 3.95-inch D2 steel blade and a black anodized, machined 6061 T-6 aluminum handle. Unfortunately, you can usually only buy these online if you’re a member of the military. The LionSteel SR-1 is a truly fantastic knife that’s a grail knife for many people. Depending on the version you get of the renowned knife, the knife is either made from a solid piece of titanium or aluminum. There is a frame lock with the rotoblock also found in the DPx Gear HEST/F 2.0. The long blade is D2, though you can also find the SR-1 and SR-11 in Sleipner, which is essentially D2. If you want an overview of the knife, I recommend reading this review from Dan at Blade Reviews. I’m surprised you didn’t find room for a Brous blade in the list. His dedication to D2 is obvious and worth mentioning. That’s a tough one, Wade. Ganzo gets a lot of flak for borrowing designs (or stealing, depending on who you ask), but there’s no denying they can put out some inexpensive knives with pretty good designs and materials, such as the Firebirds in D2 you mention. I’ll have to pick one up eventually though. Thanks for the catch. That would have been on thin knife! I corrected it.